Thanks to all coaches, competitors, referees, vendors and the dozens of volunteers from the MRRA, LRRA, UML and LHS for a great day at TRR'16. We did our best to get back to basics, and by all accounts that was the right thing to do. Thanks for playing, and be sure to mark your calendar for TRR'17 on October 1st, 2017. For complete results, click TEXTILE 2016 RESULTS. 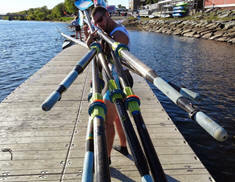 Pictures from around the regatta up on Google. Add your own pictures for posterity. Pretty cool. Watch this drone footage courtesy of David Price, rowing parent and commercial drone operator. It was shot during the early afternoon, we haven't quite figured out which events are on the water but it's 20 minutes long and only eights are in sight. Directions to the Venue: For the venue location and tips on getting to and from the regatta, visit the DIRECTIONS page. Course Awareness: Visit the MAPS page for high resolution maps of the course and venue. Coxswains should pay special attention to the Start Area Detail and Notes. Bus and trailer drivers, and parents and friends with motor vehicles should review the Land Traffic Patterns to acquaint yourselves with parking options and basic traffic guidelines. Parking questions? See the PARKING page. Basic guideline: If it feels illegal, it probably is. Trailers have slightly tougher requirements... See the TRAILERS page. For details about being a vendor at the Textile, visit our VENDORS page. Reserve Team Tent space so that you have a known rally point for your team and boosters. Choose from one of three central locations and we'll stake out 10'x10' or 10'x20' space (you provide the tent). Reservations are $75/space for the entire weekend. Visit the Team Tent Reservation page to secure your space. TRR Hotel Rates are NOT YET POSTED. Check back soon. If you're planning to stay overnight, it's worth your while to visit the Hotels and Directions page on this site where our partners at the Greater Merrimack Valley Convention & Visitors Bureau have compiled a list of area hotels that are offering special rates for visitors to the regattas. Visit the Rules and Regulations page for our best guess on the myriad rules and classifications governing this nutty sport. If you need clarification, write to us and we'll take it up with the appropriate authority. Tune in to TRR Radio! Live race calls throughout the day. Over 400 boats launched from the main docks compressed into a 3 minute video. 120 Pictures from around the venue.